The goddess protecting the land Leanbox. 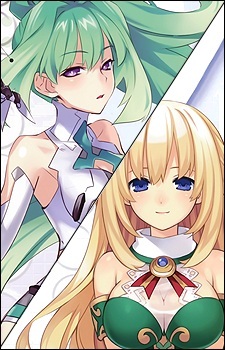 Vert is considered to be the most mature of the group, though perhaps tying with Noire, who does twice as much work. She is known to be smart, and usually very calm and polite but one of the most immature members of the group. She also isn't as strong as she believes herself to be, but she does consider her people's needs and peace as top priority and wishes for nobody to be harmed. Proven by the fact that she suggested the Goddesses teamed up, instead of fighting each other. Vert is very obsessed with Manga, Games, and Anime to the point of being an "Otaku". Her favorite types of games include rhythm, fighting, shooting, crane, racing, medal, and simulation. She also harbors a secret love of collecting "adult male-only items." However, she doesn't want others to know, mainly IF. Due to this she made Gust promise not to say anything about the "Kichiku Megane Harlem set for Virgins" which allowed Gust to take advantage of her by demanding she pay her 10% of the package cost. She even paid 10,000 so she could get the free voucher code for Planetune's MMO "Four Goddesses Online", applying 200 times by changing her name and address each time but none of them won. An obsessed video gamer, Vert is usually mature with a calm composure who generally seems to be friendly, but at the same Vert will usually put her desires and needs before more important things and seems tired more then rarely due to often playing videogames instead of work. Green Heart is noticeably different in personality, much like the others. She is very arrogant and stubborn, filled with pride when it involves her breasts which she uses to provoke White Heart consistently. Green Heart enjoys mocking others by using a sly wit and teasing. But despite this, she still cares for her people and treasures them deeply. In the summer of 2013, Hyperdimension Neptunia was given an anime adaption called Hyperdimension Neptunia: The Animation (Choujigen Game Neptune The Animation). But what made the games of the franchise so popular that they warranted an anime in the first place? Take a look for yourself.